If you’ve injured your ankle or it’s affected by a disease, not only could you be in severe pain, but you may find it difficult to remain mobile. Ryan N. Lawrence, DPM, and Joe T. Southerland, DPM, at Arlington/Mansfield Foot & Ankle Centers have undergone specialized training and are the only physicians certified in ankle replacement. If there’s a way to relieve your pain and restore function without surgery, they can find it; if you do need surgery, you couldn’t be in better hands. Call one of the offices in Arlington or Mansfield, Texas, or book an appointment online. 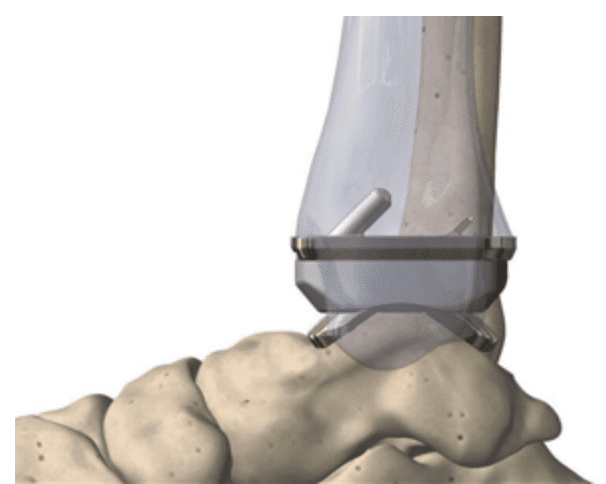 An ankle replacement, also known as ankle arthroplasty, involves removing damaged bone and cartilage from your ankle joint and replacing it with artificial replicas called prosthetics. Ankle replacements usually consist of removing the lower end of the tibia (shin bone) and the top of the talus (foot bone). The longevity of an ankle replacement varies between patients, but most last for 10 years or longer. Dr. Lawrence or Dr. Southerland can discuss the benefits of having an ankle replacement if you’re suffering from impaired mobility or severe pain that can’t be resolved by other treatments. Ankle replacement surgery usually takes place under a general anesthetic, so you won’t be aware of what’s happening or feel any pain during the procedure. Alternatively, you can have spinal anesthesia, so you remain awake but won’t feel your body below the waist. Once the anesthetic takes effect, your surgeon makes an incision into your ankle, carefully moving tissues aside until they can see the bone. All the damaged or diseased bone is taken out, leaving healthy surfaces to which the prosthesis is attached. Screws are sometimes used to ensure the stability of the new ankle joint. How long does it take to heal after ankle replacement surgery? After surgery, you need to wear a cast, brace, or splint to prevent your ankle from moving while the tissues start to heal. You might have a drain in your ankle for a few days to prevent fluid buildup, and you should keep your foot raised as much as possible to reduce the likelihood of swelling. Once healing is underway, you start physical therapy to ensure optimal healing and restoration of function in the new ankle. It may take several months for you to feel able to bear weight on the new ankle, but physical therapy ensures you build up the muscles and tendons around the prosthesis ready for weight bearing. If you’re suffering from chronic, unresolved pain affecting your ankle, talk to the team at Arlington/Mansfield Foot & Ankle Centers for a consultation. Call them today or book an appointment online.